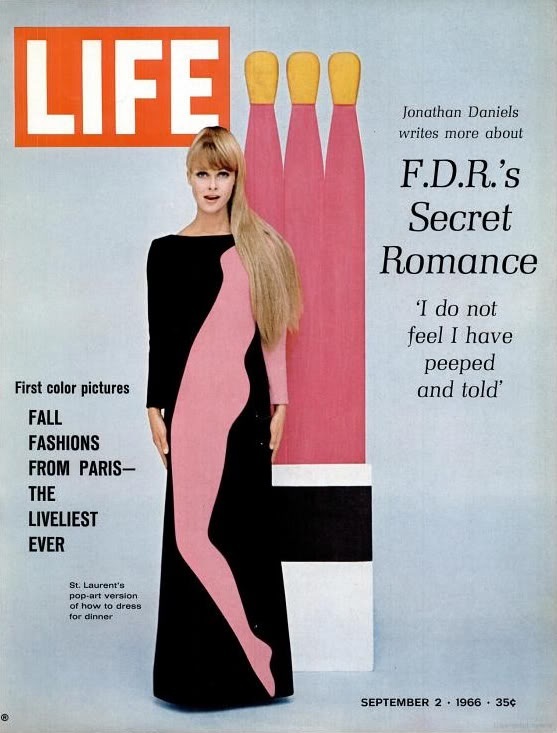 The cover of Life magazine, September 2, 1966, featuring one of Saint Laurent’s ‘Pop Art’ dresses. The iconic ‘Mondrian’ dresses from Yves Saint Laurent’s Fall/Winter 1965/66 Haute Couture collection spawned not only knock-off ready-made dresses but also knock-off sewing patterns (not including Vogue 1557, which was licensed). 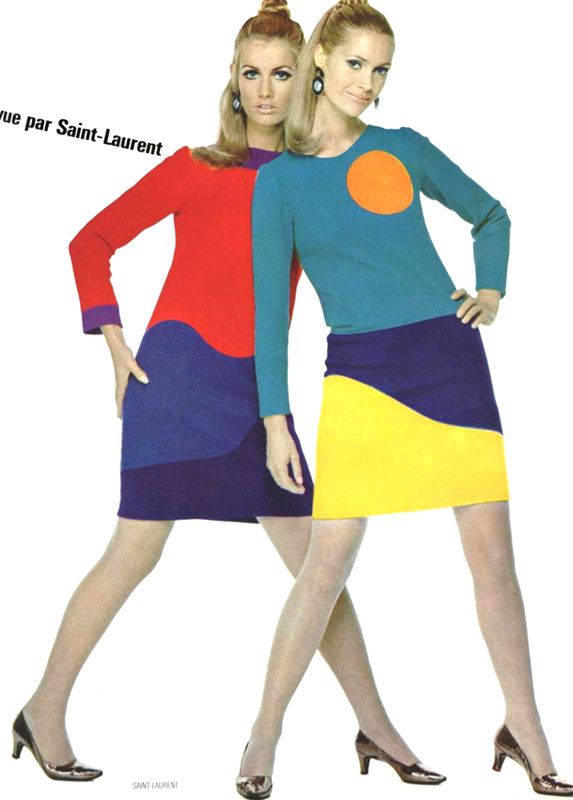 Possibly slightly lesser known are the Pop Art-inspired dresses from Yves Saint Laurent’s Fall/Winter 1966/67 Haute Couture collection. These wool jersey dresses came one year after the Piet Mondrian-inspired wool jersey dresses of 1965/66, and were inspired by the Pop Art movement and particularly by the artist Tom Wesselmann. 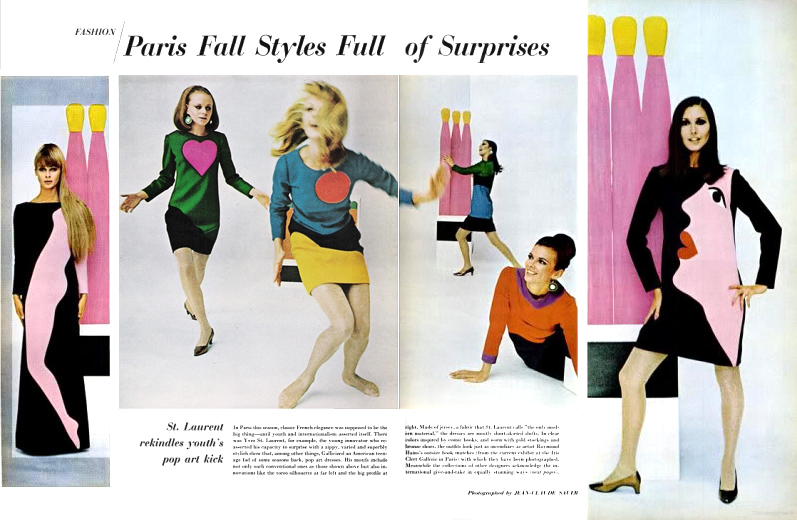 Editorial pages from Life magazine, September 2, 1966, featuring Saint Laurent’s ‘Pop Art’ dresses. As well as referencing the Pop Art movement, these dresses also reflected the mood for youthful colorful fashions as seen on the street, particularly in London. These dresses are a classic example of the influence of street fashion on the Paris Haute Couture of the mid 1960s. One expects to see home sewing patterns influenced directly by fashion trends, but I find it amusing to see direct interpretations, if not copying, of particular distinctive designs that were not officially licensed to a pattern company. Below is a page from the Fall 1966/67 Haute Couture collections issue of L’Officiel showing two colorful Saint Laurent Pop Art dresses, and directly below this is the envelope for Vogue pattern 7079, which bears a striking resemblance to the Saint Laurent dresses. 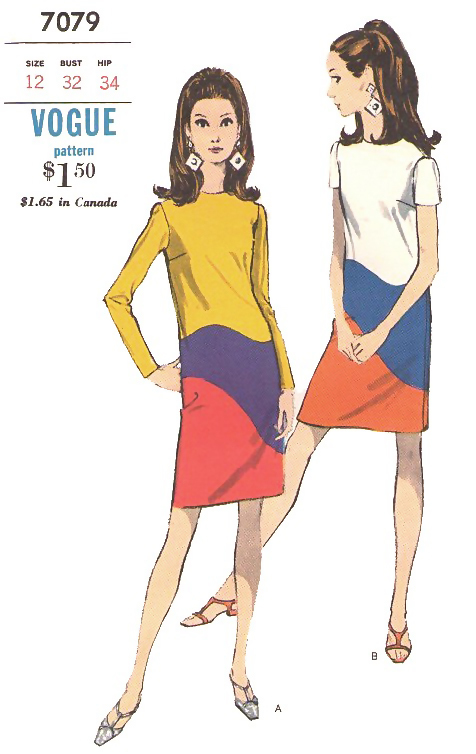 Vogue Pattern 7079, a straight color-blocked dress with a striking resemblance to Yves Saint Laurent’s ‘Pop Art’ dresses from 1966/67. I saw a copy of Vogue pattern 7079 on etsy a few weeks ago, it has since sold. It was obviously inspired by YSL’s Pop Art dresses, however it consists of a combination of design elements from both of the dresses pictured in L’Officiel – the shape of the high-hip seam is taken from the dress on the left, the shape of the lower-hip seam is taken from the dress on the right, as are the plain sleeves and neckline. After seeing YSL’s designs, to me the pattern’s design seems to be lacking something, it doesn’t seem balanced. Being such a simple garment shape, it would be quite easy to alter the pattern to incorporate a love-heart or circular motif on the bodice, or contrast cuffs and collar, or any combination of details to achieve a more authentic replica of the YSL look, don’t you think? (Note: Vogue 7079 was not designed specially for knit fabrics, like the wool jersey used to make the Saint Laurent dresses, so the intended fit of the sewing pattern may be looser than that of the Saint Laurent dresses, and where darts have been used to fit Vogue 7079, there are likely no darts on the Saint Laurent dresses). I wonder when this pattern was made available for sale? Does anyone know? The designs that were licensed to the pattern companies by the fashion houses would usually only appear in the pattern counter catalogs after the respective fashion season had passed, so it would be interesting to see if Vogue 7079 was available during the Fall/Winter season of 1966/67, allowing the home sewer to achieve a very trendy in-season Haute Couture fashion look without the prohibitive cost. 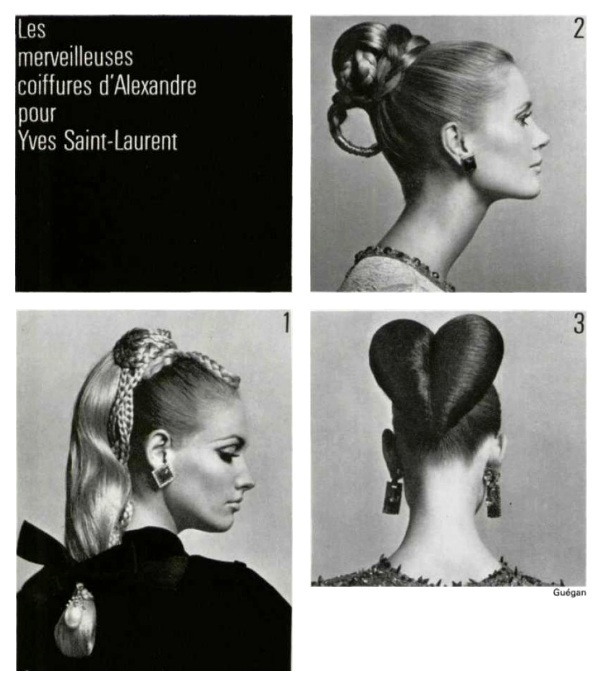 As a bonus, below is an image, also from L’Officiel, of hairstyles created by the famous hair stylist Alexandre of Paris specially for the evening ensembles of Yves Saint Laurent’s Haute Couture Fall/Winter 1966/67 défilé. The heart motif from one of the Pop Art dresses has even been carried through to the hairstyles – a ‘chignon en forme de coeur’.